Art deco style meets luscious color in this dazzling geometric of ornate floral flames and stylish pyramid shapes. The depth of shading and eclectic modernism combine for an all over pattern of mesmerizing elegance. Colors include, Sage, Sapphire, Peacock and Jade on a black ground. Focal Kaleidoscope cut from Deco by Jason Yenter for In The Beginning Fabrics. 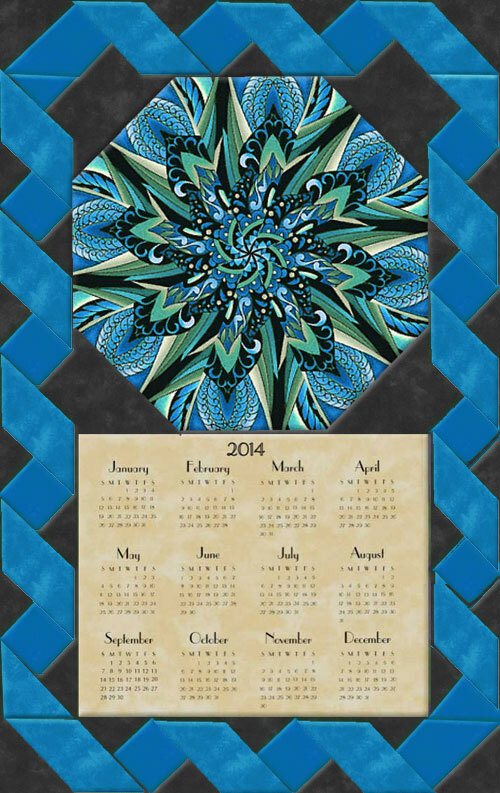 This includes the illustrated instructions to make this Wall Hanging as well as a preprinted 8 1/2 by 6 3/4 inch muslin insert with the calendar printed on it. The finished size of the Wall Hanging is approximately 11 by 17 1/2 inches. Block and 3 fat quarters included.